TRANSFORMATION 130 • SHOPPING CENTER BUSINESS • May 2018 corporates municipal streets to complete the circumference of the road network. Many exceptional sites such as Oakbrook Center in suburban Chicago and at Short Pump Town Center near Richmond, Virginia, provide completely contained circulation within the boundaries of the property. The former condition relies on integration into an existing city while the latter holds the allure of control over the development surrounding the center. Throughout the western world, the Main Street, Market Street, Rue Princi- pale, Front Street, King Street, Queen Street or High Street occupies a vertical- ly integrated mixed-use solution to both retail concentration and a feedback loop of commerce and consumption. As the primacy of national retailers has dimmed in the enclosed mall, the proliferation of local purveyors of bespoke goods on thriving commercial corridors may pro- vide inspiration for ring road redevelop- ment. Transforming an existing vehicular transportation network into a pedestrian and multi-modal commercial street might provide an alternative experience to the existing mall. By creating a more authentic retail street experience with a mix of uses surrounding and protecting the enclosed center for future development, the bor- ders of the mall proper can begin to blur with the High Street. As a historical analogy, the Ringstrasse in Vienna, Austria, provides the most poi- gnant example of a protective wall being converted over a relatively short period of time. From the 1860s to the 1890s a series of municipal buildings, commercial landmarks and institutions occupied the site of the city's former fortified walls. A distinctive architectural eclecticism adds to the heightened sense of place unique to the time and place. Instead of the mall property being in isolation as an island in a sea of parking, a mixed-use buffer might be the answer for many ring road malls. Rather than imposing an urban grid or demolishing the retail asset, a move to- ward meaningful density along existing infrastructure can be an innovative new morphology in this time of rapid and constant change. There is no one-size-fits-all approach to the future of the mall's redevelopment. With smart planning that considers typol- ogies that make retail a destination and solutions that take into account existing layouts, pedestrian and other related traf- fic and demographics, the future holds many exciting possibilities. Despite the changing face of retail, consumers still seek that interaction and what Gruen dreamed up many years ago: a commu- nity-oriented center where all can thrive. SCB Sean Slater is a principal at Retail Design Collaborative. WITH THREE MAJOR INTERSTATE HIGHWAYS, TWO RAILROADS AND THE ONTARIO INTERNATIONAL AIRPORT, ONTARIO IS THE PERFECT LOCATION FOR YOUR BUSINESS TO THRIVE. 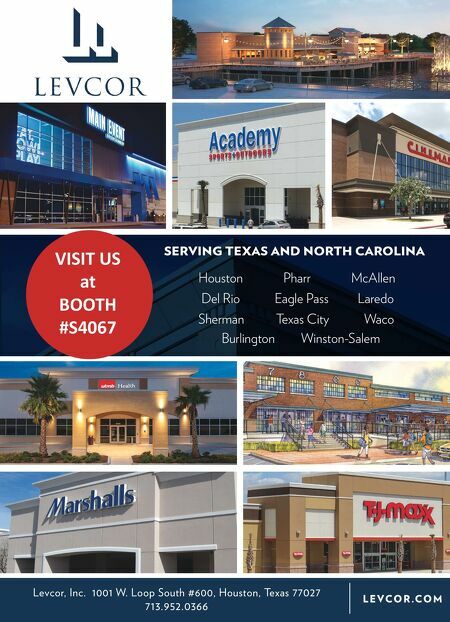 VISIT US AT BOOTH C2228 AT ICSC RECON! CALL (909) 395-2005 TO SCHEDULE AN APPOINTMENT. 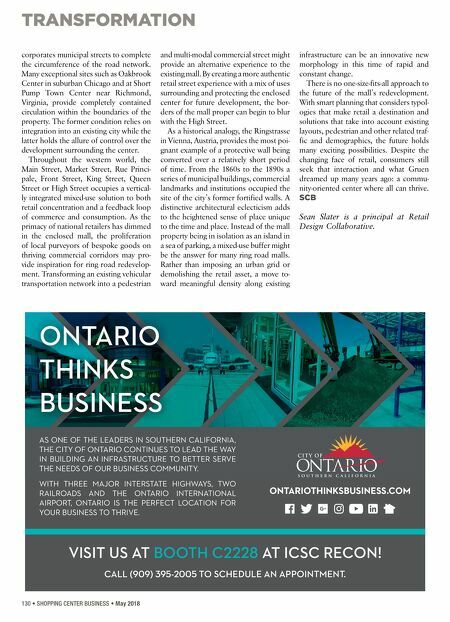 ONTARIOTHINKSBUSINESS.COM ONTARIO THINKS BUSINESS AS ONE OF THE LEADERS IN SOUTHERN CALIFORNIA, THE CITY OF ONTARIO CONTINUES TO LEAD THE WAY IN BUILDING AN INFRASTRUCTURE TO BETTER SERVE THE NEEDS OF OUR BUSINESS COMMUNITY.